Figure 5-41. A variety of AOA indicators. The purpose of an AOA indicator is to give the pilot better situation awareness pertaining to the aerodynamic health of the airfoil. This can also be referred to as stall margin awareness. More simply explained, it is the margin that exists between the current AOA that the airfoil is operating at, and the AOA at which the airfoil will stall (critical AOA). An AOA indicator can have several benefits when installed in general aviation aircraft, not the least of which is increased situational awareness. Without an AOA indicator, the AOA is “invisible” to pilots. These devices measure several parameters simultaneously and determine the current AOA providing a visual image to the pilot of the current AOA along with representations of the proximity to the critical AOA. [Figure 5-42] These devices can give a visual representation of the energy management state of the airplane. The energy state of an airplane is the balance between airspeed, altitude, drag, and thrust and represents how efficiently the airfoil is operating. The more efficiently the airfoil operates; the larger stall margin that is present. 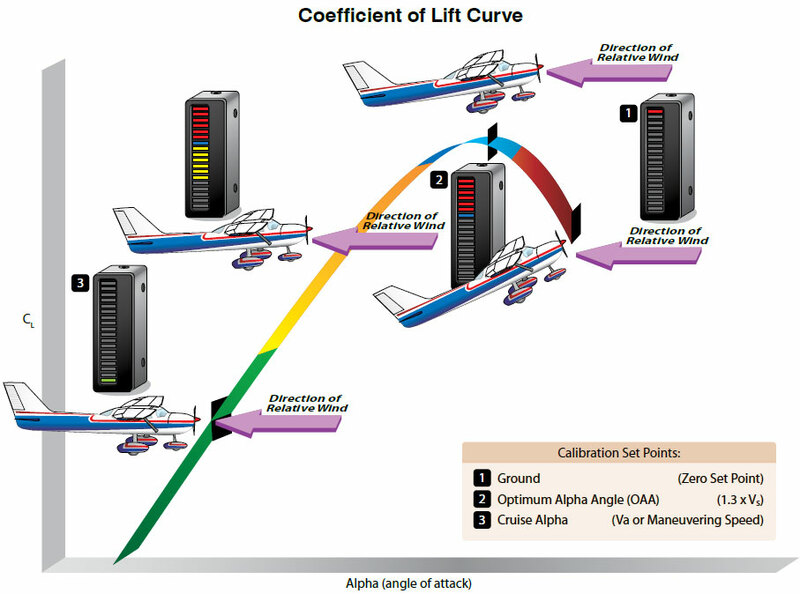 With this increased situational awareness pertaining to the energy condition of the airplane, pilots will have information that they need to aid in preventing a LOC scenario resulting from a stall/spin. Additionally, the less energy that is utilized to maintain flight means greater overall efficiency of the airplane, which is typically realized in fuel savings. This equates to a lower operating cost to the pilot. Just as training is required for any system on an aircraft, AOA indicators have training considerations also. A more comprehensive understanding of AOA in general should be the goal of this training along with the specific operating characteristics and limitations of the installed AOA indicator. Ground and flight instructors should make every attempt to receive training from an instructor knowledgeable about AOA indicators prior to giving instruction pertaining to or in airplanes equipped with AOA indicators. Pilot schools should incorporate training on AOA indicators in their syllabi, whether their training aircraft are equipped with them or not. Installation of AOA indicators not required by type certification in general aviation airplanes has recently been streamlined by the FAA. The FAA established policy in February 2014 pertaining to non-required AOA systems and how they may be installed as a minor alteration, depending upon their installation requirements and operational utilization, and the procedures to take for certification of these installations. For updated information, reference the FAA website at www.faa.gov. Pilots of general aviation airplanes equipped with AOA indicators should contact the manufacturer for specific limitations applicable to that installation.